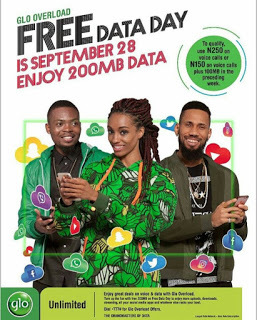 The Glo free data day started on 11th of August when they declared it as a "Free data day" which can be activated by exisiting or new users irregardless of their tariff plan. And Glo has recently announced that 28th of September when they declared it as a "Free data day". Browsing is one of the important tasks a smartphone user performs because it keeps everyone connected to the internet. Although Glo network is very poor in some location in the country Nigeria would this be good news to Glo users or it totally waste. Even before now the Glo free browsing cheat was working on some of our popular vpn such as AnonyTun Vpn, Codez Vpn, Psiphon Vpn, Tweakware Vpn, Xp Psiphon and even Stark Vpn but glo has automatically turned off their data signals if no active data in your glo line,which makes the free browsing cheat waste and useless many people just don't like the poor service Glo provides. The Glo free data day started on 11th of August when they declared it as a "Free data day" which can be activated by exisiting or new users irregardless of their tariff plan. And Glo has recently announced that 28th of September when they declared it as a "Free data day"